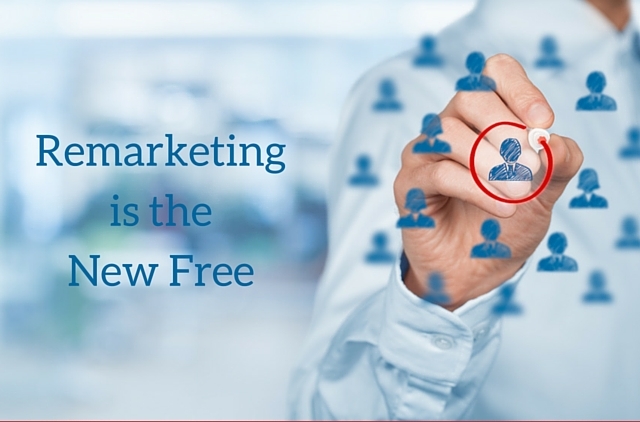 Is Remarketing the New Free? Let’s face it, we’ve become increasingly numb to the lead capture bait for email address exchange. In fact, I think it’s become so bad that while people still sign up for the free thing, they often don’t even bother to download, rarely if ever actually read it or watch it, and unfortunately, don’t represent the opportunity for marketers that they once did. The bar for starting a relationship with a prospect has evolved, and the stakes are higher. Today, we have to create awareness before a prospect understands they have a problem or certainly before they are seeking a transformation. In my opinion, this is still done by offering the right content, in the right context, but with the right delivery mechanism. People still want to find answers to their challenges and will probably always seek information in many forms. Smart marketers are grouping and personalizing content by specific category or problem-solving advice and offering that content without strings in targeted advertising environments such as Facebook. The content may be a short video or series of video, a group of blog posts or even a series of templates and checklists. The key is that this is bite-sized, useful, easy to access and easy to consume. It’s the start of a relationship without commitment. So, how does totally free content create a lead? It does so by giving and giving and giving before asking anything. High-quality content without strings attached builds trust and authority – two of the primary objectives of all marketing today. The key to making this work as lead generation tactic is something called remarketing or retargeting. Now, you may be familiar with retargeting if you’ve ever reviewed a product you were researching online. A few years ago I wanted to get standup desk and looked around at a variety of products before finally settling on one made by Varidesk. I did my research one day and visited the manufacture’s site and sure enough everywhere else I went I started seeing ads for Varidesk. In fact, even after I had purchased the desk from Amazon I continued to see the ads on many news type sites I visited. This is retargeting not so much at its finest. Or perhaps you downloaded a free report on a site and when you returned to get the next one in the series they already knew your name and email and automatically completed it in the form. This is another type of very useful retargeting in a way. Essentially what retargeting involves is placing a cookie on a visitor’s browser that indicates they have come to your site. This cookie then allows ad networks to show certain ads when you visit one of their sites. Many people dislike this technology, and you can manage it by changing your privacy settings to disable it. Of course, a lot of things you do like, such as a website you frequent remembering your settings is activated using this same approach. One of the more effective ways to use retargeting in a gentle lead nurturing sense is by using Facebook’s retargeting tool. You simply run sponsored ads at highly targeted, useful content or a series of content and let Facebook tell you who visits and consumes the content. Once this mechanism is in place, you can start building custom audiences of the people that visited your free content with the knowledge that they may indeed be interested in a more substantial version of the content in exchange for an email address or opt-in. This approach, while requiring more patience, opens up a much larger potential audience and will likely make your list conversions triple or quadruple. And, you might want to look for retargeting services outside of the Facebook walls, so take a look at PerfectAudience for a super easy approach or one of the pioneers of retargeting, AdRoll. One of the beautiful things about this approach is that it not only allows you to nurture people who visit your website, but it also allows you to create segmented campaigns for people based on what they visited. For example, I attract many small business owners who are interested in tips and tactics for growing their business, but I also serve a growing network of independent marketing consultants who are interested in ways to grow a more profitable practice and serve more customers. Using a retargeting approach, I can create a highly personalized experience for these radically different audiences based on an understanding of the content they visited. Now, understand that this approach is certainly not limited to Facebook – Facebook just offers a nice way to use it to build awareness and trust. This is essentially the same technology that powers inbound marketing tools such as Hubspot or many CRM and marketing automation tools. It’s the same technology that powers many of the more sophisticated lead tracking tools such as ClickMagick or Kissmetrics. The real lesson in this is that marketers today must understand that as brands big and small continue to take advantage of the technology to serve more personalized, useful and relevant experiences the more our prospects will come to hunger for and expect the same from any business they engage – whether they know it or not.